Home Blogs Snap Shots The Future is L16? There is a company called “Light” which might have the start of the new camera revolution. Called the L16, it is unlike any camera that has gone before. 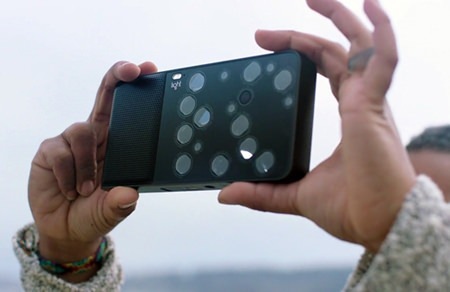 Looking like a thick smartphone it has 16 lenses with an optical zoom range of 35 mm to 150 mm and an end result of 52 MP images. One feature we have seen before is the ability to alter the depth of field after the shot has been taken though there are other cameras that allow you to refocus after the fact, like the Lytro Illum, but the L16 will have actual video capabilities as well. The user can then change the image’s depth, focus and exposure and even share it on social media via built-in Wi-Fi. It also excels in low-light situations with its 16 sensors working together. It takes advantage of what the company has described as a “silent revolution” in photography. Simplifying the process, according to an in-depth report just released, the need to put better quality cameras in smartphones has miniaturized camera components and created high-quality plastic lenses. For the L16 five of the lenses are 35 mm, five 70 mm lenses with mirrors, and six 150 mm lenses. It uses these to take different details from a scene and then merges the data into a 52 megapixel picture. The L16 includes 35-150 mm optical zooms and claims to have advanced low-light performance, low image noise and precise depth of field control. These are turned sideways, so the zoom function remains inside the camera itself. Claims by the Light company include “The L16 is the first multi-aperture computational camera that packs DSLR quality and capability into a device that fits in your pocket,” says Light. It is also “smaller, lighter, less expensive, and provides better image quality than any camera in its price class.” (The last part of that claim my be open for discussion as the L16 costs $1,700, and is due to be released in late September 2016. Out of the 16 individual camera units inside the L16, 10 of them fire simultaneously to capture the detail of an image at different fixed focal lengths. The device runs on Android and has a 5 inch touchscreen on the back for editing and sharing photos using its built-in Wi-Fi. Light also say that Foxconn had licensed its technology to build a similar camera into future smartphones. That price isn’t for the faint of heart – or the amateur weekend photographer. And even though the technology the L16 utilizes is really exciting, I believe customers are going to need to know a little bit more before they feel comfortable queuing up to be the first on the block with one. Seeing as this camera is built with photographers in mind, filmmakers will no doubt need to know more about its video features before considering it an option for their projects as well. My feeling is that this particular electronic camera is just the start of the revolution, reminding me of the original XT PCs, which did most everything in its day, but the new computers do it just so much better and faster. It will be the same with electronic cameras. So you want to be a glamor snapper?